ZBWS – Hard Surface Fun! I’ve been pushing on the hard surface side of things during the holiday period. I tried another attempt at a spacecraft sort of design utilizing hardsurface techniques. I’m getting the hang of it now and I’m getting a better handle on polishing tools. Through Ryan’s Zbrush Certification course, I was also exposed to IMMs. (Insert mesh brushes). I’ve been exposed to these guys for a good while now but it’s been recently that I’ve started to figure them out better, both for kit bashing and adding details. 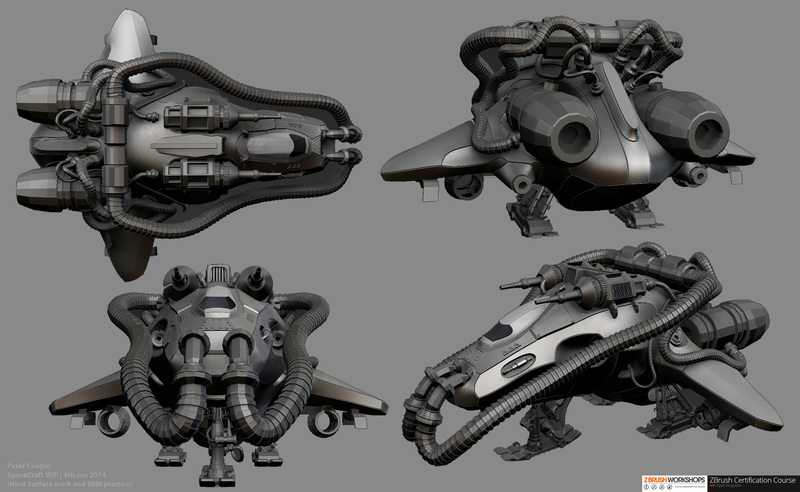 I must say, I didn’t think I’d be creating hard surface models within Zbrush anytime soon! I had a lot of fun designing the main hull with panel loops etc. The undercarriage design on this ship was fun to, I used nothing but IMMs for that. The whole piece is 100% Zbrush.